Coconino High School student Sophie Weinzinger was named state champion at the Arizona Poetry Out Loud state finals in downtown Phoenix on Saturday, March 3. Weinzinger participated in the Poetry Out Loud national competition in Washington, D.C. this week, where she made it to the final round of nine competitors. Kimberly Jarchow, one of the leading forces behind the Flagstaff Poetry Slam, addresses the crowd during the Viola Awards Saturday, March 3. Jarchow received the 2018 Emerging Artist award. Coconino High School student Sophie Weinzinger, on the right, was named state champion at the Arizona Poetry Out Loud state finals with Willow Canyon High School student Antonio Juarez coming in as first runner-up. Coconino High School student Sophie Weinzinger was named state champion at the Arizona Poetry Out Loud state finals in downtown Phoenix on Saturday, March 3. Flagstaff celebrated two wins for the literary community last weekend with the Viola Awards and a poetry recitation competition in downtown Phoenix, but local logophiles seem to be just getting started. Sophie Weinzinger, a junior at Coconino High School, will be representing Arizona at the 13th annual Poetry Out Loud national finals in Washington next month after her win at the statewide competition March 3 at Arizona State University. Emma Collier of the Flagstaff Arts and Leadership Academy and Sylvia Dale of Ganado High School were also a finalists in the state competition. Poetry Out Loud, a program of the National Endowment for the Arts and the Poetry Foundation, aims to instill a passion for literature into the next generation by capitalizing on the latest trends in poetry, namely recitation and performance. Participants work on their public speaking skills, self-confidence and learn about literary heritage. This was Weinzinger’s third year competing at the state level against 10 students from schools across Arizona. She was named first runner-up during last year’s competition. Teresa Wilson, her English teacher, even traveled to Phoenix to give moral support as Weinzinger recited “Hysteria” by Dionisio D. Martínez, “Tarantulas on the Lifebuoy” by Thomas Lux and “Dirge in the Woods” by George Meredith. As state finalist, she received a $200 stipend and will travel to the nation's capital on an all-expenses-paid trip for April 24-25 competition. CHS also received a $500 stipend to be used for the purchase of poetry books, and a recording of the state competition that will be broadcast on PBS on Friday, April 6, at 7:30 p.m. The robust poetry scene in Flagstaff is certainly having a well-deserved moment in the spotlight as demonstrated further by slam poet Kimberly Jarchow’s win for Emerging Artist at last week’s Viola Awards Gala. The nominees in that category ran the gamut of artistic mediums from ceramic artist Ben Craigie and musician Quinn Scully to playwright Daniel Stigmon and filmmaker Ember Crowley. Her accomplishments within the scene run deep, though. 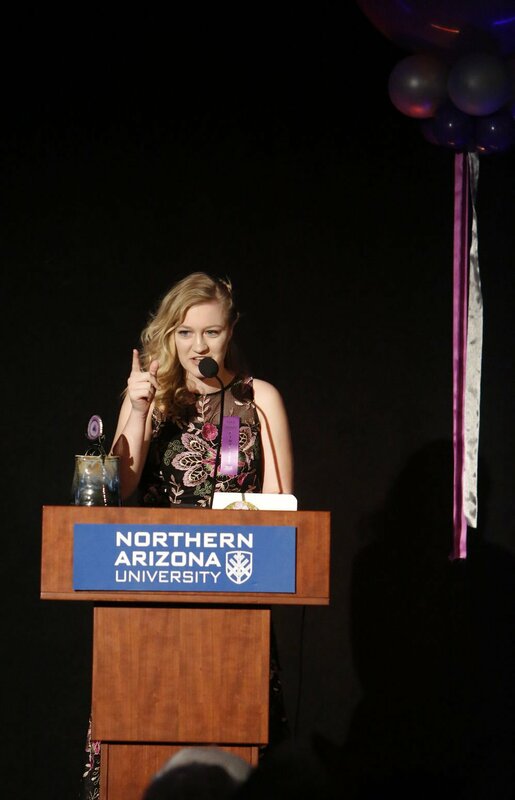 A junior at Northern Arizona University double majoring in English and strategic communications, Jarchow has been involved in slam poetry here for the past three years, which has given her opportunities to perform in competitions both locally and nationally. Last year, she qualified to compete in the National Poetry Slam in Denver and has also performed at a Write About Now showcase in Houston. As a participant and one of the organizers of the Flagstaff Poetry Slam, Jarchow has found a tight-knit community of like-minded people who don’t shy away from exposing their vulnerabilities in the name of art. “Even as people graduate or move away there’s a new batch of people who become involved in the community, so it’s always growing and it's super cool,” she said. One of the newest literary programs to be introduced to the community is Poetry Out Loud at the Library. It began roughly four months ago as the brainchild of longtime Flagstaff Public Library volunteer Barbara Felix, who was involved in a similar event when she lived in Tucson. She said the events, held every third Wednesday of the month, have gained a steady attendance of around eight people each time. All of the reading material is provided by the library, which includes a short biography of the featured poet as well as several poems to be read aloud and then discussed. At the February meeting, participants read poems by a selection of Native American poets, but they’ve also looked at the work of Robert Frost, Maya Angelou and Alberto Ríos, Arizona’s first state poet laureate. This month’s meeting on Wednesday, March 21, will explore some of Alison Hawthorne Deming’s poetry and the April readings will focus on Persian poets Rumi and Hafez. “Even though some of these poets may speak to their cultural background or an area of the country that they are from, the themes in poetry are universal to the human condition,” Taillac said. Poetry is a timeless art form that is relatable across generations and cultures, and students and others in the area continue to spread that expression in Flagstaff and beyond. The Flagstaff Poetry Slam is hosted every Wednesday at Firecreek Coffee Company, 22 Historic Route 66, beginning at 8 p.m. with a $2 entry. Poetry Out Loud at the Library is held every third Wednesday at the Flagstaff Public Library, 300 W. Aspen Ave., from 2-3:30 p.m. The next meeting will be March 21 featuring poet Alison Hawthorne Deming. The Poetry Out Loud state competition will be broadcast on PBS Friday, April 6, at 7:30 p.m.